Rebecca and Flora Hawes, sisters in the late 1800’s, are always in search of adventure, especially Rebecca who, filled with an insatiable longing for more than school and high society, drags Flora along. As teens they sneak away from school, their Paris hotel, and the safe parts of their own city, filled with youthful heedlessness and enthusiastic intentions. The adventures help compassionate Flora find her calling early, but not Rebecca. 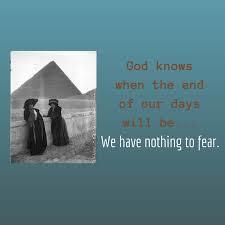 Eventually the sisters brave sandstorms, unpredictable Bedouins, and endlessly bickering servants in search of a biblical manuscript. Will Rebecca finds what she needs to convince ‘the professor’ that Christianity is true? Where We Belong is not only about the privileged Hawes sisters but also about Peterson, orphaned son of a Swedish gangster, and young, red-headed Kate, scrambling to live in the streets of Chicago. 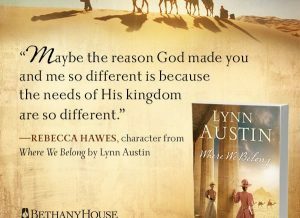 How these four end up in the Sinai Desert, and why, is a story worth telling, and Lynn Austin tells it well. As always, Austin’s characters are full of life and zest as they slowly mature, and the settings are filled with story themselves. 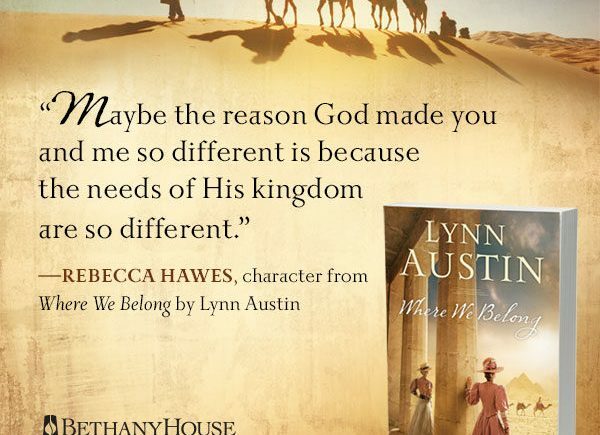 Where We Belong is not a fast-paced story, but it hints at so many intriguing possibilities that it is very difficult to put down. As a novel, it is very good. 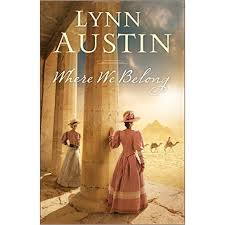 As history, it is fascinating, based on the story of self-educated Scottish sisters of the 1800’s who did find an ancient manuscript near Sinai. 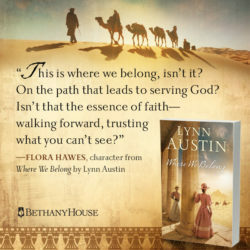 However, there is more to Where We Belong than to the average historical novel; in this unique book Austin explores what Christianity means. She considers compassion and how one can love God and help society’s vulnerable in many practical ways. She shows how intellectual pursuits can accomplish the same goal, especially among those who are vulnerable to lies. Ultimately, she reminds us that God has different tasks for different people. A book like this can leave me with the oppressing feeling of not doing enough in life. However, we must remember the vital fact that God has different callings for each of us, just as he did for Rebecca and Flora. We are not all hands in the body of Christ, for example, and no one should ever suppose that his own personal calling applies equally to all Christians. This is addressed to some extent in Blind Spots by Collin Hansen, and it is a common failing of those who have been called passionately—to help a certain group of people (foster children, senior citizens, the hungry), to be involved in certain issues (politics, origins debates, pro-life work), or to serve in any other specific ways. We cannot all be involved in all such endeavors, and we are not commanded to do so. Instead of spreading ourselves thin trying to do everything everyone else thinks we should do, we need to learn to discern how we, in our particular situation and with our particular gifts, are called to love God and people. And that is, in part, what Where We Belong is about. Despite the depth of this book is it a compelling story of adventure, youthful escapades, travel, and even romance. It is difficult to put down and I enjoyed it immensely. Miss 15 considers Lynn Austin’s books boring, although I think she would enjoy many parts of this one. But it is true that her books, like this one, are thoughtful and do not appeal to everyone, even though she has sold over a million copies and won many awards. If, however, you are a Christian and willing to be challenged as well as entertained in your reading, then this book is for you. May God bless you as you read as well as afterwards, whether you serve in a soup kitchen, or develop technology to enable de-urbanization, or walk the halls of power. Agnes and Margaret Smith, on whom Rebecca and Flora are modeled, used this as their motto. 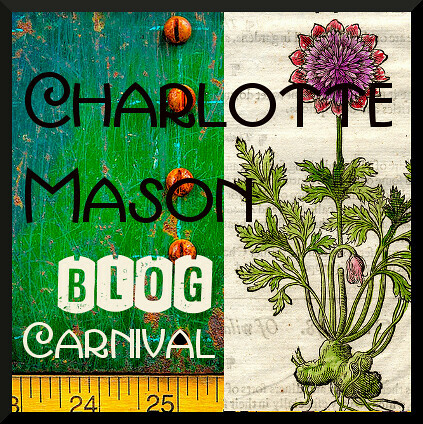 If you enjoyed this revew, you might want to follow me on Google+ where I often mention helpful or interesting ideas, or connect with me on GoodReads where I share what I read. 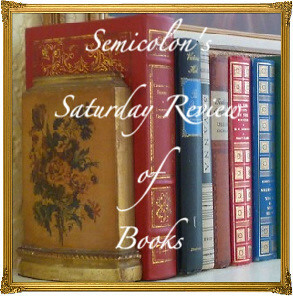 Posted in: 52 Books in 52 Weeks, Quotations, Reviews, Reviews: Fiction.